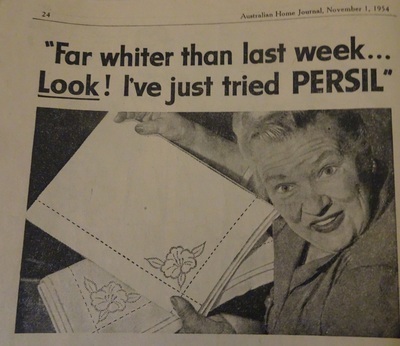 I was looking at the advertisements in old Australian Woman's Journals from the nineteen fifties. The ways we do things, including getting our clothes clean, have certainly changed. 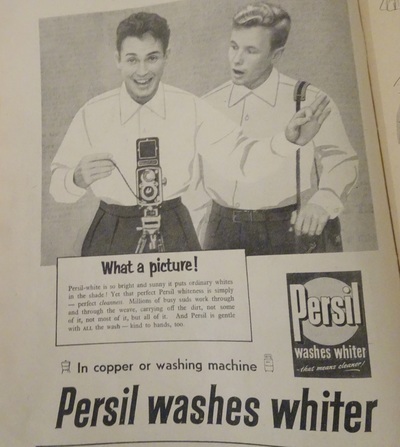 When I saw adverts for Persil washing powder I remembered my Grandma doing the washing on a Monday when I was a little girl. Monday was the day to do your washing. 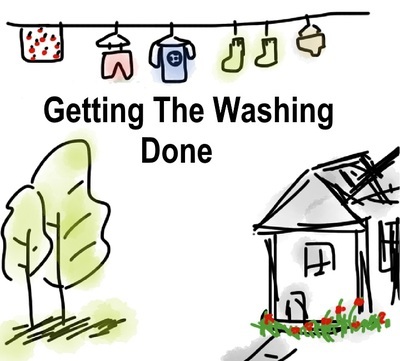 Today we do the washing when there is enough for a load or when we desperately need a particular item to be clean. What else has changed about doing the washing? Back in time it took most of the day to get the washing done. The copper had to be heated up because of course you needed hot water. There were no hot water services. If you didn't have a washing machine the task would take even longer as you would need to use a scrubbing board to get clothes clean. Sometimes people boiled clothes in the copper. In 1951 automatic washing machines started being manufactured in Europe but I wasn't aware of their existence until quite a few years later. These days we are encouraged to wash in cold water. This helps the environment and saves a bit of money on the power bill. However, some argue cold water doesn't kill germs and that always using cold water allows a build up of fat and other gunk in the washing machine which can be detrimental to its functioning. There is such a variety of machines on the market these days. Top loaders, front loaders, big, small, automatic, semi-automatic, the variations go on and on. There was little variety of products for washing the clothes in the fifties, soap, soap flakes, powder, only a few brands. And you needed bluo to make your whites look whiter. 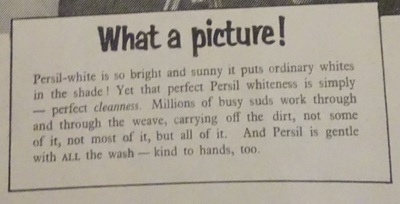 The ads for Persil made me smile. Did women really get this excited about having sparkling whites back in the day? I believe one was expected to have white whites and I think sheets were always white. I rarely buy white items and my sheets are coloured, often patterned. Today there are detergents as well as powders, products for top loaders, some for front and others that claim to do a good job with both types. There are environmentally friendly products and some promoted as being especially good in cold water. You can still buy bluo and there is bluo sanitiser which claims to destroy 99% of germs and fungal spores in cold water. There is plenty of choice. Today you can peg your clothes on the line and let the breeze and sun dry it for you. Alternatively, you can use a tumble dryer and from things I have read on the internet I gather some American homes had a tumble dryer back in the fifties. Grandma had an extra clothes line under the verandah to cater for rainy days. Today, I have a clothes line under my back verandah and don't have a tumble dryer. My washing gets done by an automatic machine while I am busy with other things. I don't compete with others about the whiteness of my wash and I don't compare the appearance of my wash from one week to the next. I would have failed as a 'housewife' of the fifties, lucky I was only a child back then.